With their self-developed coaxial laser-wire processing head, the scientists of the Laser Zentrum Hannover e.V. (LZH) are meeting the demand for a flexible system for the Additive Manufacturing with wire materials. 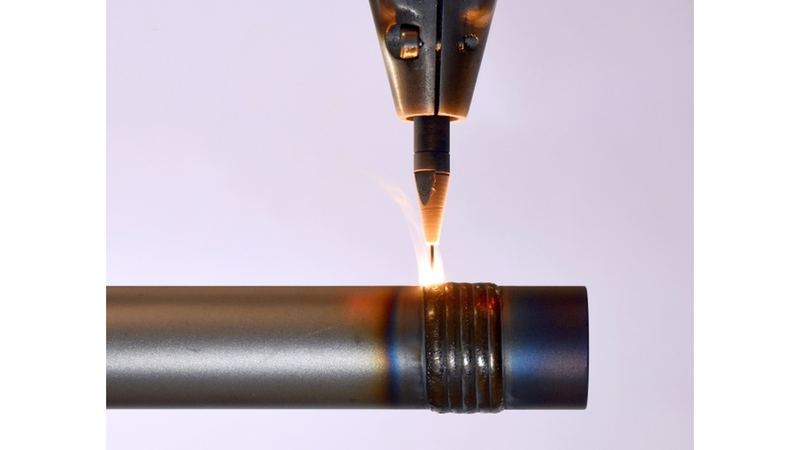 The coaxial guidance of the laser radiation to the wire-shaped coating material allows a direction-independent Additive Manufacturing. This is an enormous advantage, especially for the construction of complex structures as well as for the repair and coating of components. The filler material can either be supplied cold or electrically heated by conduction. This approach leads to a significant increase in energy efficiency and offers process engineering advantages. An axis system or articulated robot moves the 10 kg laser head during the machining process. Typical fields of application of the coaxial laser-wire processing head are the generative manufacturing of structures, the coating of surfaces and the repair of cost-intensive components, such as molds and tools. The coaxial guidance of wire material and laser radiation not only allows the extension of existing structures. By means of the processing head, components can even be given additional functions, such as internal channels, which cannot, or only partially, be fabricated using conventional methods.